Call to speak to a compliance expert today! OSHA’s Recordkeeping Standard, 29 CFR 1904, composes the framework of OSHA’s overall occupational safety and health recording system. Many employers want to be compliant but struggle to understand whether particular workplace incidents are OSHA recordable or not. 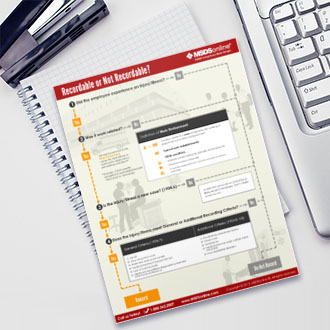 To help safety professionals navigate through this sometimes difficult process, we’ve created a free downloadable Recordable Decision Tree. Complete this form to get our recordable info tree infographic. Eliminate even more of the guesswork with MSDSonline’s cloud-based Incident Management application.